Petrus Jeftha took six wickets for Oundle. Peterborough Town were big winners in the Rutland League yesterday (August 16). 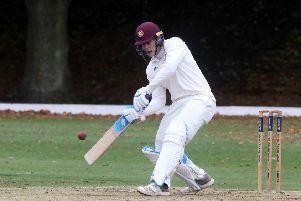 David Clarke and Marcus Howard found runs hard to come by in the Northants League Premier Division the previous day, but yesterday they were bang in form against Division One visitors to Bretton Gate, Barnack. Clarke led the way with 88, hitting 12 fours and a six, while Howard made 67 not out as Town compiled a useful 227-2. And that was always too much for Barnack. Wickets tumbled quickly and they were shot out for 62. Danny Mohammed was top wicket-taker with 4-10 and there was 3-14 for Connor Parnell as Town won by 165 runs. The Division One game between Nassington and Oundle, which also doubled up as a John Wilcox Trophy semi-final, was a very low-scoring affair. Visitors Oundle batted first and were dismissed for 95 in 34.3 overs. Harrison Craig was chief destroyer with 4-23 and Daniel Bandaranaike took 3-43. Nassington similarly found it difficult to score runs and they went for 85, giving Oundle victory by 10 runs. Best Oundle bowler was Petrus Jeftha with 6-10 off 9.1 overs.